No single raindrop is responsible for the flood. Stormwater is falling rain or melting snow that can't be absorbed by pervious surfaces or that flows off impervious surfaces and enters Howard County's stormwater drainage system—eventually flowing to the Chesapeake Bay. Along the way, the runoff picks up pollutants and carries them to local streams and rivers, where they can harm plants and animals and even cause erosion and flooding. Explore the graphic below to learn more about behaviors that cause stormwater pollution and solutions that can help prevent it. You can help reduce stormwater runoff and protect our water. A rain barrel is a system that collects and stores rainwater from your roof that would otherwise be lost to runoff and diverted to storm drains and streams. Usually, a rain barrel is composed of a 55-gallon drum, a vinyl hose, PVC couplings, a screen grate to keep debris and insects out, and other off-the-shelf items. A rain barrel is relatively simple and inexpensive to construct and can sit conveniently under any residential gutter down spout. Since 2010, 650+ free, pre-drilled barrels (to be made into rain barrels) have been distributed to residents at demonstrations and the annual GreenFest. Residents can purchase rain barrel parts at a reduced price at a local hardware store, in partnership with the County. A rain barrel is the perfect way to water your lawn and garden while saving water. Rain gardens are shallow, planted depressions that collect and absorb runoff from rooftops, sidewalks, and streets. Rain gardens are versatile features that can be installed in almost any unpaved space and typically feature low-maintenance native plants. Rain gardens can cut down on the amount of pollution reaching creeks and streams by up to 30%. The County conducted rain garden workshops for residents, who installed 30 residential rain gardens in the Red Hill Branch subwatershed. The Howard County Office of Community Sustainability partnered with University of Maryland Extension and continues to host residential rain garden and stormwater landscaping workshops. Instead of a typical concrete or asphalt walkway or driveway, property owners should consider installing permeable pavers to help minimize stormwater runoff. These interlocking pavers, typically made of concrete, create voids on the corners of the pavers that allow runoff to soak into the ground. Grass is typically encouraged to grow in between permeable pavers, to further improve permeability using their root channels. Whenever you wash your vehicle in the driveway or street, untreated, detergent-rich water flows down the street and into the storm drain. This water may contain high amounts of chemicals, nutrients, metals, and hydrocarbons. Washing your vehicle on grass or permeable pavement. This allows for dirty water to be soaked into and filtered by the ground. Bringing your vehicle to commercial car wash facilities. These facilities often recycle their water and/or are required to treat their wash water discharge prior to releasing it to the sanitary sewer system. Most stormwater impacts from car washing are from residents, businesses, and charity car wash fundraisers that discharge polluted wash water to the storm drain system. Many people perform maintenance on their vehicles in their driveways or on the street. 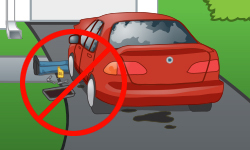 While this activity isn't always a problem, it's important to remember that any spills of oil or other chemicals that occur will get washed into the storm drain the next time it rains. To help prevent dangerous chemicals and materials from entering into the environment, you should always remember to prevent and clean up any chemical spills. You could also take your vehicle to a professional facility for service or proper disposal of old oil. Not only are animal feces a nuisance in our environment and on the bottom of our shoes, but it also presents serious health risks. Pet waste carries bacteria, viruses, and parasites that can make people, especially children, sick. Pets can catch diseases from contact with infected feces of other pets. Pets and children who play in yards or parks where pets defecate are most at risk for infections from disease-causing bacteria and parasites found in pet waste. It is much easier to pick up pet waste than to care for and worry about a sick child or pet—so get scoopin'. Did you know that over 6,200 lbs of dog poop is generated every day in Howard County? Dog waste left on streets, pavement, yards, driveways, or along roads does not magically disappear or fertilize the ground. Animal waste that's improperly disposed of can be picked up by stormwater runoff and carried into storm drains or nearby streams, causing significant stormwater pollution and potential health risks to adults, children, and pets. As pet owners, we all have a responsibility to properly dispose of our pet's waste. Take a plastic bag or paper cup along when walking your pet. Dispose of the waste properly in the provided public or household trash receptacles, or by flushing it down the toilet. Pick up the waste every time, everywhere, even in the snow. Try to keep your lawn at least 3" in height to minimize weed growth, reduce the need for watering, and decrease the likelihood of pests. Get a soil test first to know what your lawn actually needs. Consider choosing natural alternatives when possible. Don't overuse chemicals—read the labels carefully and measure your yard. Check the weather forecast to avoid applying them before a storm. Only Rain Down the Drain! Don't dump anything down storm drains. Litter is a primary cause of stormwater runoff pollution, but it's also one of the easiest to prevent. Properly dispose of trash and recycling. Sweep your sidewalks and driveway, and compost or dispose of the debris rather than hosing it down and washing it to the storm drain. 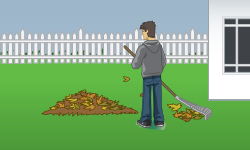 Clean up yard clippings and leaves to avoid them being washed into the storm drain when it rains. 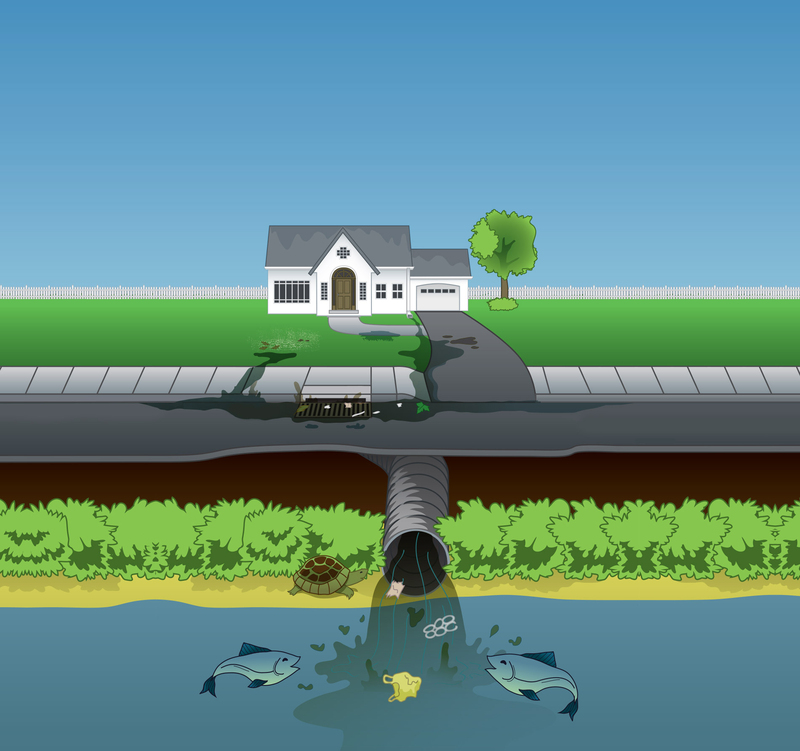 Fight runoff with awareness: tell your neighbors "only rain down the drain" and complete a storm drain stenciling project in your neighborhood. Rain, snow, and other precipitation falls onto rooftops and into gutters, then flows through a building's downspouts to the ground. The heavier the precipitation, the greater volume of stormwater runoff there is. As runoff from the roof flows over a yard, it picks up fertilizers, pet waste, and sediment and carries it to the street. Surprisingly, grassy lawns do not absorb very much stormwater runoff. Runoff from yards flows to the street, where it picks up additional pollutants, like litter, oil from cars, and grass clippings and leaves swept to the curb, and carries them into the storm drain. Pathways and other hard surfaces in a yard also contribute to runoff. Rain and snow cannot be absorbed into the ground but instead flow across the yard and into the street. Runoff travels from a roof downspout down the driveway, picking up oil from cars, salt from de-icing, spilled fertilizers, and other pollutants, and carries them into the street. Runoff, containing debris and pollutants from the yard and street, flows unfiltered and untreated into the stormwater drainage system, where it's carried directly to local streams, rivers, and lakes—and eventually to the Chesapeake Bay. Runoff from impervious surfaces, like driveways, flows quickly into the street and then to storm drains, where the polluted water flows directly to local waterways—and eventually to the Chesapeake Bay. Leads to erosion at high volumes. Makes unsafe conditions for swimming and fishing. Can even contaminate our drinking water. Stormwater is an issue that affects all of us—and we all play an important role. Howard County is committed to reducing stormwater runoff, and we need your help. You can help improve the quality of your community waterways by adopting stormwater management practices that help stormwater absorb into the ground, reuse it, or control it. Looking for some easy, low-cost ways to become part of the solution? Join over 230 users of our free stream monitoring app, the Stream Mapper, to help us keep track of Howard County’s streams’ health. Want a hands-on project? Try painting some storm drains to remind our community that only rain—not trash or leftover household supplies--belongs in our storm drains. Over 240 drains have been painted in our community! Since 2012, the READY (Restoring the Environment and Developing Youth) summer jobs youth conservation corps built over 100 rain gardens that manage over 10 acres of impervious area. Learn more and watch an amazing short video about their work. Howard County has created a list of materials (and local stores that sell them) to help you with your next stormwater project. If you would prefer to hire a contractor click here. If you need help with rain garden maintenance, check out materials from an event we recently held in partnership with the Office on Aging and the University of Maryland Extension. The County also installed 30 residential rain gardens in the Red Hill Branch subwatershed. Since 2010, 920+ free, pre-drilled barrels (to be made into rain barrels) have been distributed to residents at demonstrations and the annual GreenFest. Residents can purchase rain barrel parts at a reduced price at a local hardware store, in partnership with the County. Check out this blog to find simple ways to become part of the water pollution solution! We all rely on Howard County’s stormwater management system. When we’re home or out and about, every time we drive on streets, park in parking lots, or use buildings, the water that runs off these surfaces and rooftops has to go somewhere—and we trust that it will be properly treated and managed. Like the water utility that maintains our drinking and waste water treatment, Howard County’s stormwater management program ensures that stormwater is treated and managed, and also maintains our storm drains, underground pipes, ponds, and streams. The Chesapeake Bay and Maryland’s streams and rivers continue to suffer from significant water quality problems caused by stormwater. To help, the U.S. Environmental Protection Agency (EPA) and the Maryland Department of the Environment (MDE) have increased the stormwater management requirements for local governments. In order to improve water quality and comply with our permits, Howard County must increase activity and funding for our stormwater program. The Watershed Protection Fee funds projects that treat stormwater runoff and improve the stormwater infrastructure in Howard County. These projects aim to improve the water quality of streams in your backyard, other local waterways, and the Chesapeake Bay. All property owners are charged a fee based on the size of their property (residential) or the amount of impervious area on their property (commercial & non-profits) that allows untreated stormwater to run off to the nearest stream. The Watershed Protection Fee will be included on the real property tax bills which will be issued July 1 of each year and is only billed once per year. Watershed Protection Fee credit applications must be submitted before April 1st in order for any credit to be applied to the current year tax bill. $90 for own­ers of homes on lots larger than one-quarter acre. If you aren't sure about the exact size of your lot, check the State Departments of Assesments and Taxation's website here. - If you believe you were billed in error (note County law only allows adjustments for 3 specific reasons) please complete the Adjustment Request Form here. - Reduce your property’s fee with a fee credit and help improve the quality of local waterways by adopting stormwater management practices. Learn more here.